I’m sure were all waiting for this. 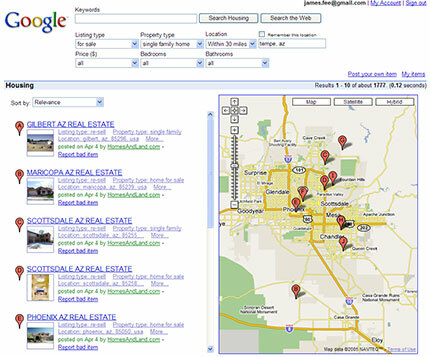 Take Google Maps and mix in Google Base and you get Google Real Estate. If you perform a search for “Real Estate” or “Homes For Sale” you get an option to search a zip code for any home for sale. Of course a quick gander at local homes for sale in the Phoenix area shows that Google Base has a long way to go before it can compete against Realtor.com. Update - looks like you can do the same thing with a car search too. I’m guessing we are seeing the integration of Google Base into the normal Google search.